The Widening Participation Outreach team were honoured at The Palace of Westminster, in the NEON Awards. 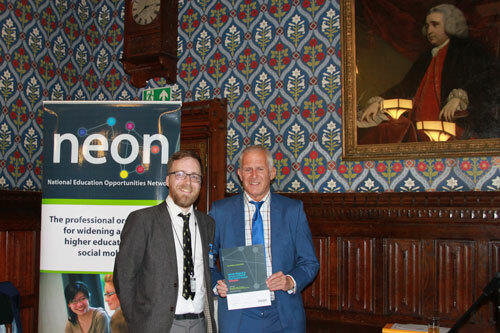 The event which was presented by Gordon Marsden, Shadow Minister for Higher Education, saw Ben Copsey, Widening Participation Project Officer, collect the NEON Outreach Award and the Wider Participation Outreach team receive a commendation for Institution of the year. The NEON Awards provides a platform to celebrate the accomplishments of staff and students across the country, for widening access to higher education and enabling social mobility. Ben said: “Being invited to the Palace of Westminster for an awards ceremony was quite strange – I tend to think of our WP work as being very academic and low profile! It was incredibly nerve wracking but great to see that the kind of work we do with young learners is so valued. “We’ve worked hard on the Primary Outreach Programme and while winning an award for that is great there’s absolutely no time to rest on laurels, as events start again soon and this is usually the busiest part of our year. “For me the most important thing is to channel the pride at winning into doing more events with more students and providing even better support for schools in our local area.